Am I getting the most out of my telescope and digital camera when imaging? Are you? I decided to find out for myself - by experiment and linking those results to theory. 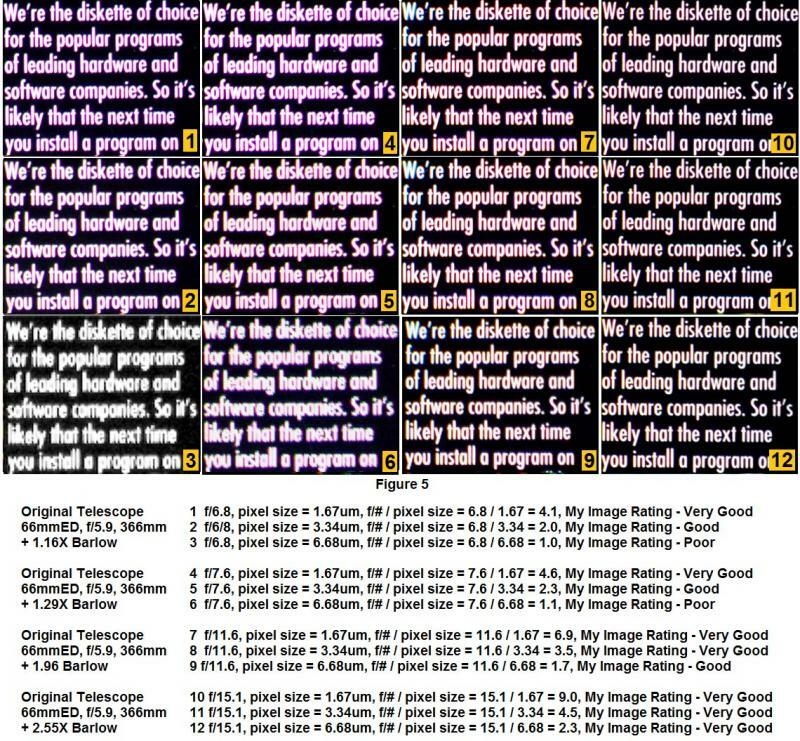 Experiment: Using a single telescope, several focal reducers & Barlows and two video cameras capable of binning 1x1, 2x2 and 4x4 pixels, I investigated the resolution limits imposed by the focal ratio / pixel size. Theory: I compared the experimental resolution limits of focal ratio / pixel size to theoretical resolution limits of the number of pixels across the diameter of the Airy disc. For a target, I chose the small white printing on black background from a box of computer diskettes. I positioned the box about 27 feet (9 meters) from the telescope objective lens. I illuminated the box with two lights, set about 45 degrees on either side of the box. Note: I was all set up with a green filter to conduct my tests in semi-monochrome green light. But then I thought, I don't image in monochrome; I possess only color cameras. The only time I shoot with a green filter is for sun spots in white light using the green filter to bring out surface granulation. So I tossed away the green filter idea and conducting these experiments in white light with color cameras - just as I would normally image the moon, planets and deep sky objects. I took short 10-frame videos of the target at various focal numbers (f/#'s). I later converted the videos into ten 'tif' format images and took the first frame as the image to work with. Each image was scaled up or down to be 280 pixels across for presentation here. Focal number: Focal number, also called f-number (f/#) is the ratio of objective lens focal length divided by the diameter of the objective lens. To achieve different focal numbers, I inserted different focal reducers, Barlows and extensions into the optical-imaging train. 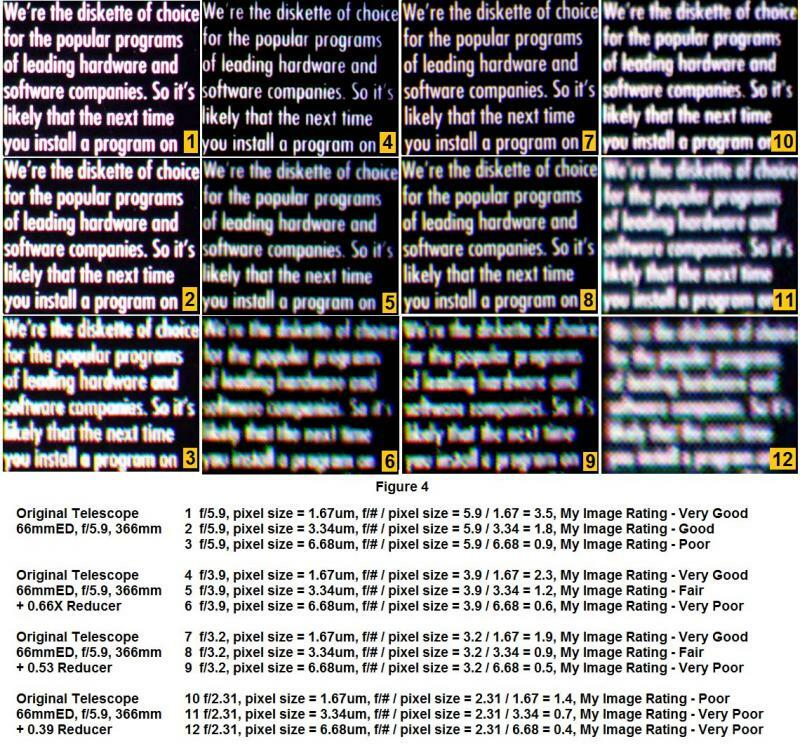 The actual magnification/demagnification effect was determined by measurement of the increase or decrease in size of selected portions of the image. I managed to change the f/5.9 telescope over a range from f/2.54 to f/41.4. Further, by changing the sensor binning factor from 1x1 to 2x2 and 4x4, I was able to vary pixel size from 2.2, to 4.4 to 8.8 microns. Figure 1 shows the images obtained at ratios of f/# / pixel size from 0.29 to 2.68. Figure 2 shows the images obtained at ratios of f/# / pixel size from 0.8 to 6.9. Figure 3 shows the images obtained at ratios of f/# / pixel size from 2.2 to 18.8. Graph 1 is a plot of my image rating (very poor, poor, fair, good and very good) versus the ratio of focal number / pixel size. It appears that a focal number / pixel size ratio of 4 or more produces very good images. Image quality appears to fall off rapidly as the ratio decreases below 2. I repeated this experiment using a second video camera - one with smaller 1.67 micron pixels. I took single frame 'tif' images of the target at various focal numbers (f/#'s). Each image was scaled up or down to be 280 pixels across for presentation here. To achieve different focal numbers, I inserted different focal reducers, Barlows and extensions into the optical-imaging train. The actual magnification/demagnification effect was determined by measurement of the increase or decrease in size of selected portions of the image. I managed to change the f/5.9 telescope over a range from f/2.31 to f/32.3. Further, by changing the binning factor from 1x1 to 2x2 and 4x4, I was able to vary pixel size from 1.67, to 3.34 to 6.68 microns. 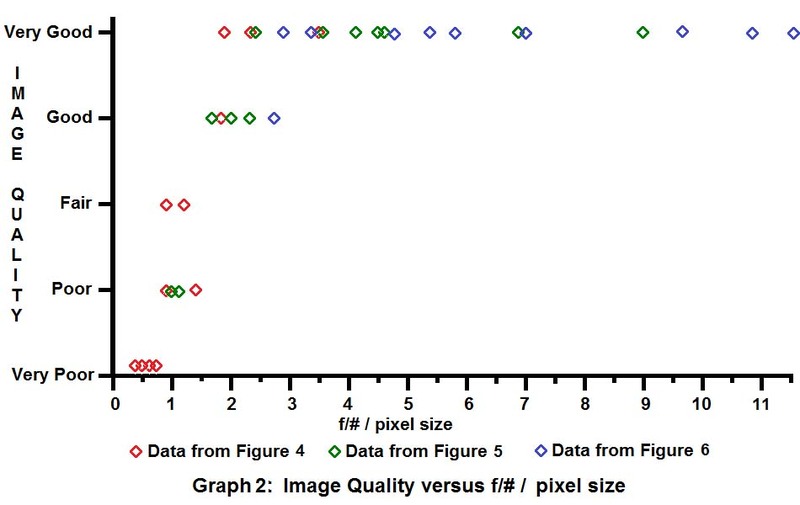 Figure 4 shows the images obtained at ratios of f/# / pixel size from 0.4 to 3.5. Figure 5 shows the images obtained at ratios of f/# / pixel size from 1.0 to 9.0. 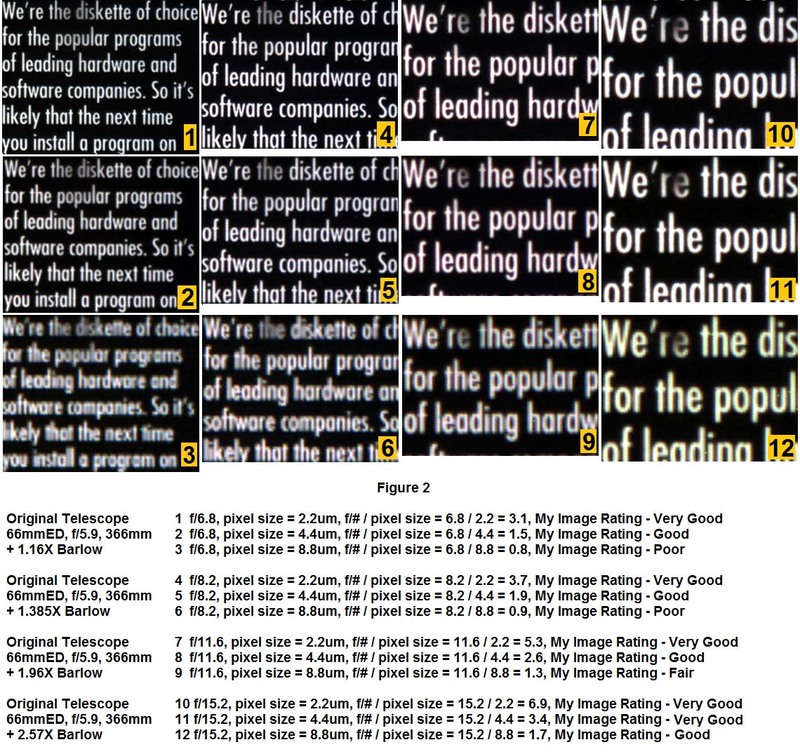 Figure 6 shows the images obtained at ratios of f/# / pixel size from 2.7 to 19.3. Graph 2 is a plot of my image rating (very poor, poor, fair, good and very good) versus the ratio of focal number / pixel size. It appears that a ratio of 3.4 or more produces very good images. Image quality appears to fall off rapidly as the ratio decreases below 2. Your Dawes limit is 4.6 / 2.6 = 1.75 arc-sec. Dividing that by 3, your optimal pixel scale should be around 0.6 arc-sec. If you raise the focal ratio then you raise the focal length and lower the pixel scale, your image becomes over sampled (not bad). When you lower your focal ratio, then you lower the focal length and raise your pixels scale, your image becomes under sampled (not good). When the pixel scale drops below 1/3 of your Dawes limit, you are over sampled and looking good. When it goes above 1/3 of your Dawes limit, then you start becoming under sampled and looking bad (pixelated). Thus, if focal_ratio / pixel_size is less than 5.2, then under sampled (bad), and if greater than 5.2, then over sampled (good). We can ignore seeing because your are looking across a room, not miles of atmosphere. Edited by syscore, 25 January 2017 - 11:36 PM. Graph 3 is a plot of the data obtained from both cameras, the NexImage 5 (2.2 micron pixels) and the AmScope MU1000 (1,67 micron pixels). 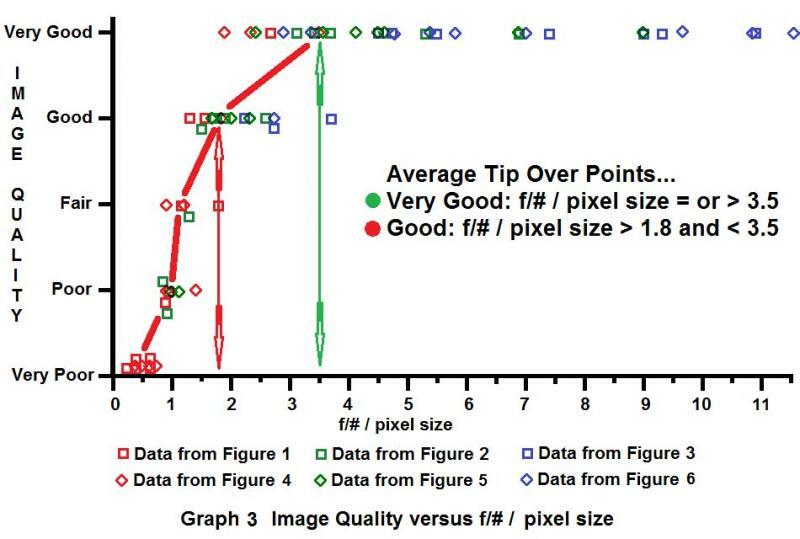 - Very good images were obtained when the ratio of focal number / pixel size was equal or greater than 3.5. - Good images were obtained when the focal number / pixel size was greater than 1.8 and less than 3.5. - Below a ratio of 1.8 the quality of the images decreased rapidly with a ratio of 1.2 being fair, 1 being poor and 0.6 or below being very poor. Why does this happen? Where does this Rule for Digital Image Resolution come from? The answer to that comes from theory... of the Airy disc. When light from a point source, like a distant star, passes through an aperture (e.g. 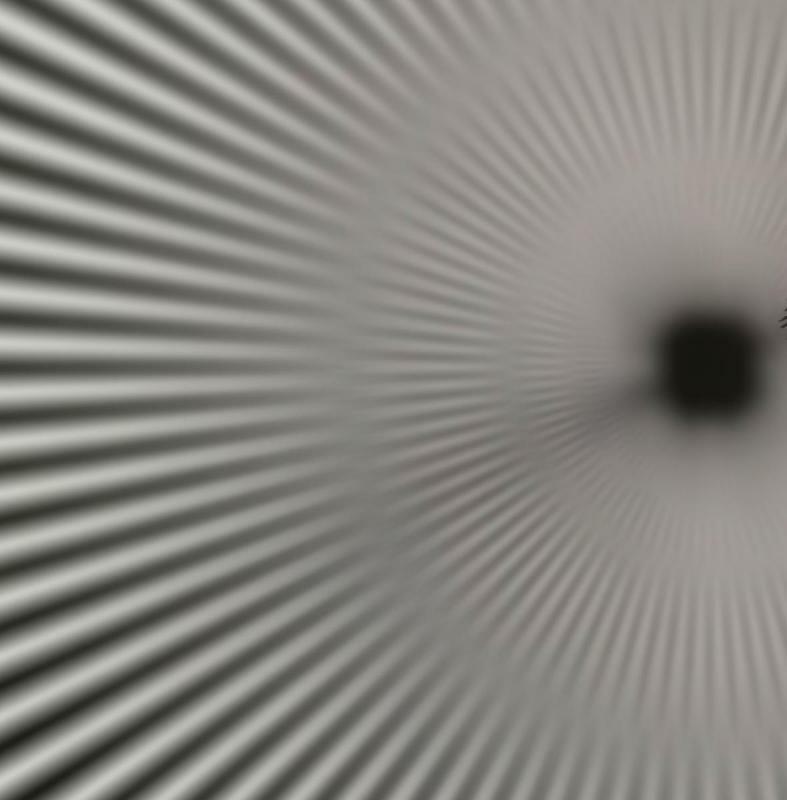 a lens), the light is bent and forms an image called a diffraction pattern - that looks like an archery target, comprised of a central bright bull's eye surrounded by alternating black and white rings of decreasing intensity. The Airy disc is roughly that bright center portion. By definition, the diameter of the Airy disc is measured from the center of the first black ring, across the bright center portion, to the center of the same black ring on the other side. 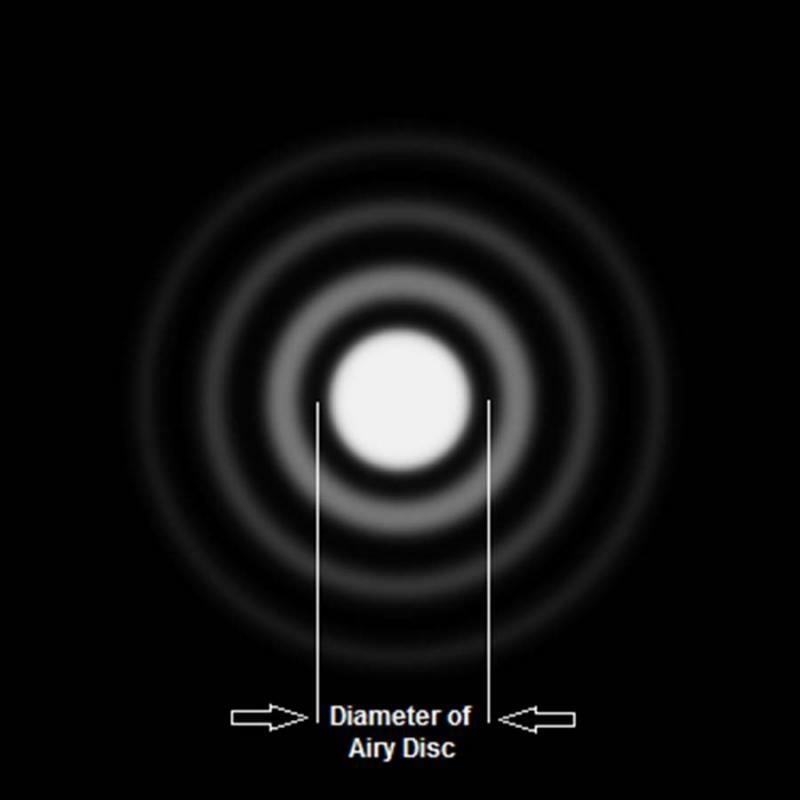 To resolve (reasonably image) the Airy disc, how many pixels do I need to put across the diameter of the Airy disc? Here's an illustration that I created showing the effect on image resolution due to number of pixels across the Airy disc. - 9 pixels across the Airy disc reproduced the original image (Align 1 and Align 2) very well (1/4p Blur). - 7.5 and 6 pixels across the Airy disc did a good job of reproduction too. - 4.5 pixels across the Airy disc, the resulting image (1.4p Blur) was beginning to be fuzzy. - 3.0 pixels across the Airy disc, the resulting image (1.4p Blur) was fuzzy. - 1.5 pixels across the Airy disc, the resulting image (1.4p Blur) was only a blur. So perhaps the limit here is at least 4.5 pixels across the diameter of the Airy disc. How does this relate to my rule of thumb for Digital Image Resolution: f/# / pixel size = a minimum of 3.5. In the illustration, there are corresponding columns for f/# / pixel size and for number of pixels across the Airy disc diameter. the ratio f/# / pixel size should be a minimum of 3.5, that means placing 4.5 or more pixels across the diameter of the Airy disc. What are the ramifications of this limit on digital image resolution? I'm concerned that I don't make a goof and use either too fast a telescope or a camera with pixels that are too large... and end up with poor images. The very best gear won't help me if I violate this rule for digital image resolution. I normally use a NexImage 5 camera with 2.2 micron pixels, so I'm OK. In fact my ratio f/# / pixel size = 10 / 2.2 = 4.55, so I'm into very good images. In fact my ratio f/# / pixel size = 9 / 2.2 = 4.09, so I'm into very good images. If I use a NexImage 5 camera with 2.2 micron pixels, I'm a little over that 2.14 minumum pixel size. My ratio f/# / pixel size = 7.5 / 2.2 = 3.41, so I'm likley into very good images. However, since I also have a NexImage 10 camera with 1.67 micron pixels; that would be a safer choice. Then, my ratio f/# / pixel size = 7.5 / 1.67 = 4.49, so 'Id be solidly into very good images. If I use my NexImage 5 camera with 2.2 micron pixels, my pixels are too large. In fact my ratio f/# / pixel size = 5.9 / 2.2 = 2.68, so maybe I'm into only good images - not, very good images. I would be better off using my NexImage 10 camera with 1.67 micron pixels. Then, my ratio f/# / pixel size = 5.9 / 1.67 = 3.53, so I'd be into very good images. This needs a special calculation since I'm dealing with a longer (656.28nm) hydrogen-alpha wavelength than the teal-green (527nm) wavelength used previously here. I go to the fundamental criterion of 4.5 pixels across the Airy disc. I want a minimum of 4.5 pixels across this diameter. If I use a NexImage 5 camera with 2.2 micron pixels, I'm into very good images. If I use my NexImage 10 camera with 1.67 micron pixels, I will gain a magnification increase of 2.2 / 1.67 = 1.32X but no more resolution since I already met the minimum criterion of 2.49 micron pixels. Recall that I said, "The very best gear won't help me if I violate this rule for digital image resolution." - a $11,870 Takahashi TOA-150B Double ED Triplet Refractor at f/7.33 with a focal length of 1100mm. 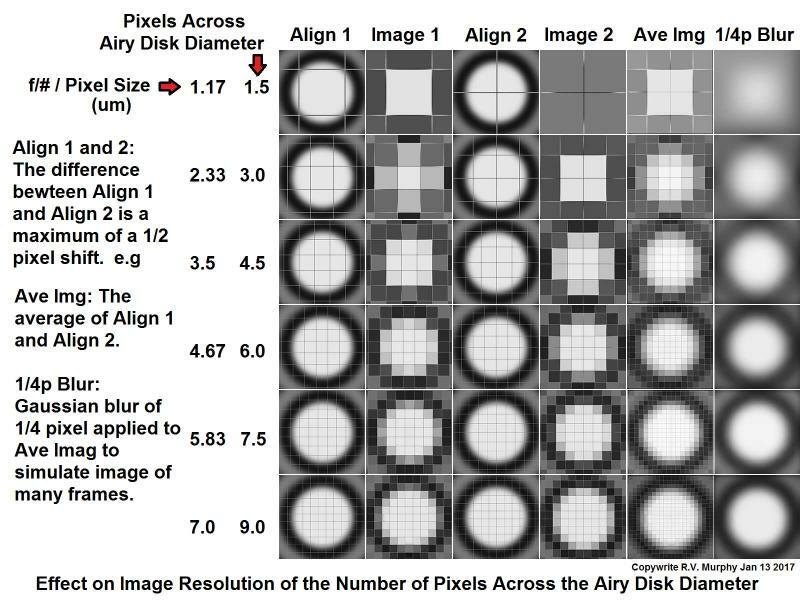 Recall the Rule of Thumb for Digital Image Resolution: the ratio f/# / pixel size should be a minimum of 3.5 or put 4.5 or more pixels across the diameter of the Airy disc. For the combo: ratio of f/# / pixel size = 7.33 / 6.45 microns = 1.14, well below the minimum of 3.5! In fact, the ratio of 1.14 means this telescope/camera combo can only produce 'poor' to 'fair images'. The problem is that those large 6.45 micron pixels of the Nikon D5 are unsuitable for the f/7.33 TOA-150B. US$18,369 + tax to get poor or fair pictures? Interesting... perhaps shocking? I did these experiments and theory illustrations for my own satisfaction and my own understanding. I'm satisfied that my telescopes and cameras are working within the limits of resolution to produce 'very good' images. You may have noticed that my telescopes may be typical of what you have. For my telescopes, the rule for digital image resolution requires pixel sizes in the range of 1.7 to 2.9 microns. Those sizes are considerably smaller than the pixel sizes often used in astrophotography. Maybe you are using a Barlow, have higher f/#'s, and thus are OK. Still, you might want to ask yourself, "Am I losing image resolution?" I'm leaning versus a higher multiplier for f than the often suggested 3. Better 5 or even 7. The reason is that the signal has also to be processed by some algorithms, e.g. filters to improve the image. This is the reason that audio signals are sampled at 96 or 128khz for hi-fi quality while tha sound bandwidth is only 16k Nyquist theorem is valid for infinite lengt signal and is an absolute minimum. It is a quite informative post you've started here but it does fail towards the end. Theoretical resolution and practical resolution are two very different things. Take for example a 40" F/3 tracking dob, a Paracorr Type II and an ASI1600 for its high gain and low read noise. The Paracorr pushes that F/3 into a F/3.45 with its 1.15x amplification. Using your formula it would be 3.45/3.8= 0.9 which would put it into the Very Bad resolution category. This is however a resolution of 0.224"/pixel and under somewhat average skies of 3", well the image is going to look very soft due to the seeing. Under circumstances like this the TOA-150 and Nikon D5 would actually fair quite nicely with a resolution of ~1.2"/pixel. Slightly longer FL or smaller pixels would be better BUT it'll still perform very nicely. There's gonna have to be some sort of compromise. Using this math, my WO Star 71 (354 mm focal / 71mm aperture) would require a 0.7 arc sec per pixel camera? At APS-C chip sizes that pushing a 218 MP sensor (?) which doesn't exist. Unless I'm not following the math or made a unit error. Edited by lakeorion, 26 January 2017 - 09:34 AM. True. In the experiment, the object was stationary. When tracking and guiding are involved, what is a "good" resolution can become a bad image, and what is a "bad" resolution becomes a good image. In other words, you want under sampled to hide tracking / guiding errors. There are several theoretical 'limits' to resolution depending on the situation, the most common being the Rayleigh limit and Dawes limit. One could argue for days as to which theory is more correct under any given circumstance. For my part, I wanted to see for myself where the 'rubber met the road' - by doing practical tests with my real telescope and my real sensors. After examining my experimental results, I looked for a means to explain my findings graphically. Only after that did I build my own theory to explain my results. 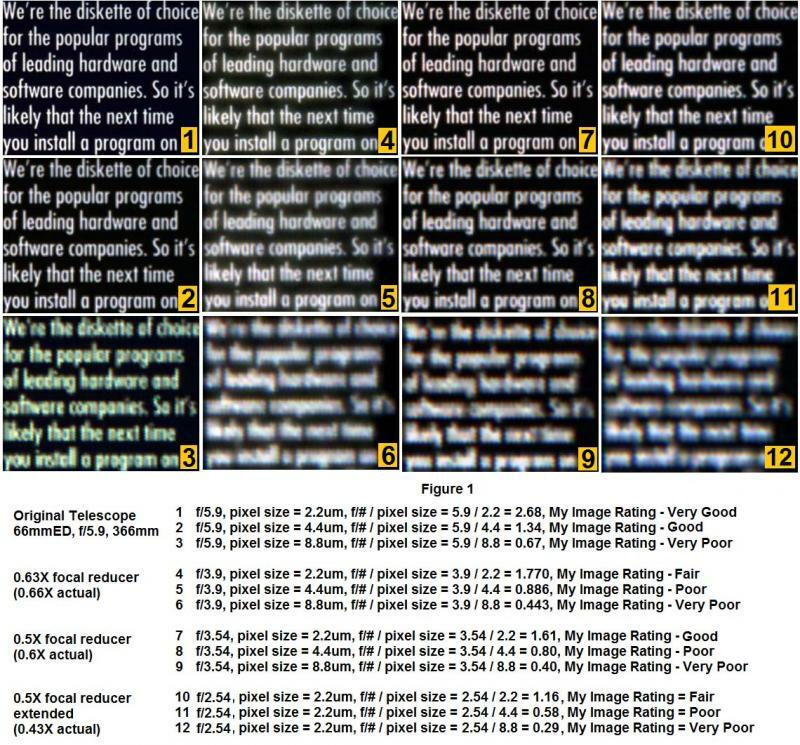 My practical results showed that 'very good' images were obtained when the ratio of f/# / pixel size = 3.5. I showed that this corresponded in theory to 4.5 pixels across the Airy Disk diameter. If one wishes to use a different approach based upon Rayleigh limit, Dawes limit, Nyquist–Shannon sampling theorem, etc. or to be over-sampled for presumed safety in later image processing... by all means go ahead. Just be aware that believing in such a limit will restrict what you will attempt in practice - given today's (2017) equipment. My 1.67μm pixels meet that requirement. Result: I image and get 'very good' images. My small 1.67μm pixels are too large to meet that requirement. Result: I'm so far off being close to meeting that requirement that I don't even attempt imaging. Theory is nice and has it's place - for sure. However, I believe that the evidence from practical tests with real equipment is best... and that's what I'm going with. Actually, there is a range. The recommendation is between 2 and 3 times the Dawes limit, and that is just a number, which agrees pretty closely with your range in your plot. However, people don't image with short focal lengths to achieve their Dawes limit, which as you just showed, would be impossible because they don't make cameras with pixels that small. 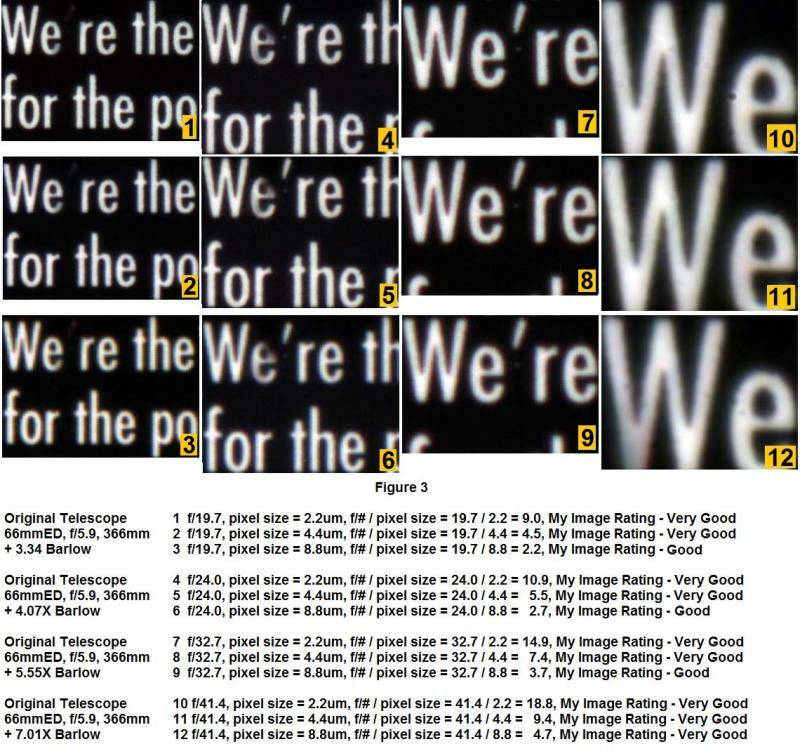 They image with short focal lengths to make tracking (mount) issues less significant, and the reason that works is that the images are under sampled which hides the errors. That is why it is pixel scale that is key. But if you have a good mount, then you can use smaller pixels and high resolution. As a 'people', I image with short focal lengths (350mm and 389mm) all the time to capture the full lunar or full solar disc in one image. While longer focal lengths may be used on the moon and the images stitched together to cover the full lunar disc, this is approach is not easily applied to hydrogen alpha images of the sun because of more rapid changes in the solar surface and prominences. Regardless of your reasons, because of the size of your pixels, and the focal length of your scope, you are shooting at a large pixel scale. My point was, even though using a camera with smaller pixels would result in more detail (as your data shows), it wouldn't if the tracking was not up to the challenge or you are taking very short exposures. I think your experiment is great, and your numbers seem to jive with the rules of thumb. 1) How did you image all of the targets at infinity? This is not a valid comparison of image sharpness if they were at different finite conjugates or if you had to refocus (from infinity.) Remember that not all optical systems or focal reducer/extender combinations will be well corrected at finite conjugates. 2) It looks like you are ignoring radiometry and seeing effects. Starting with the Airy disk is fine for a small telescope but it is necessary to use an average seeing blur size as the size of the scope gets bigger than about 8"-10". Oversampling the Airy disk under even average seeing conditions will simply decrease signal strength and do nothing whatsoever for image sharpness. The size of the blur disk should be selected for the best possible conditions. 3) Your term for "digital resolution" is not a good one. The term "resolution" has a very specific meaning when it comes to astronomical telescopes and your terminology treads on very thin ice. Call it something like "image sharpness" index (which you did in your charts) and it will less objectionable. 4) As you know, the size of the Airy disk in the focal plane is simply a scaled value of the F/# so your variable of F/# per pixel size is nothing more than a number related to the number of pixels across the Airy disk (although the units are wrong--you need to multiply the F/# by the wavelength to fix this.) There's nothing wrong with your way of doing it and it's easy to remember but it makes less sense (to me anyway) than talking about Airy disk sampling directly. 5) There is a rich body of literature about image evaluation using test targets and that's what you've done here. (This is a favorite method for evaluating military optics and imaging systems.) You've done a nice job and you might enjoy reviewing some of that literature to better understand the standard methods and terms for such tests. By using the appropriate targets, you can directly measure the MTF of the whole system (optics+sensor.) It would almost certainly be a lot easer to characterize the point at which MTF drops below a fixed value at high resolution to eliminate your subjective evaluation of "image sharpness." I'll attach an image of a binary radial grating that I took with my cell phone defocused to demonstrate phase reversal to give you an idea of how that might work. Other test targets are widely available on the web. Edited by jhayes_tucson, 26 January 2017 - 03:58 PM. readers should take care not to oversimplify or overemphasize concepts and be fooled into thinking such rating of this piece of equipment or that piece of equipment will guarantee a type of quality. Getting a good match between sensor pixel size and focal length is only a part of the equation. the entire system must be considered. It would be ill advised to only consider a telescope f ratio and the size of a video cameras's pixel size without considering many other factors if one is pursuing the best image resolution to result. Ans: If you read my post, I stated, "I positioned the box about 27 feet (9 meters) from the telescope objective lens." RE: 2) It looks like you are ignoring radiometry and seeing effects. Starting with the Airy disk is fine for a small telescope but it is necessary to use an average seeing blur size as the size of the scope gets bigger than about 8"-10". Ans: There are no "seeing effects" in my basement... that I know of. If you read my post, I stated,"Telescope: Williams Optics 66mmED telescope (f/# = 5.9, focal length = 389mm)". 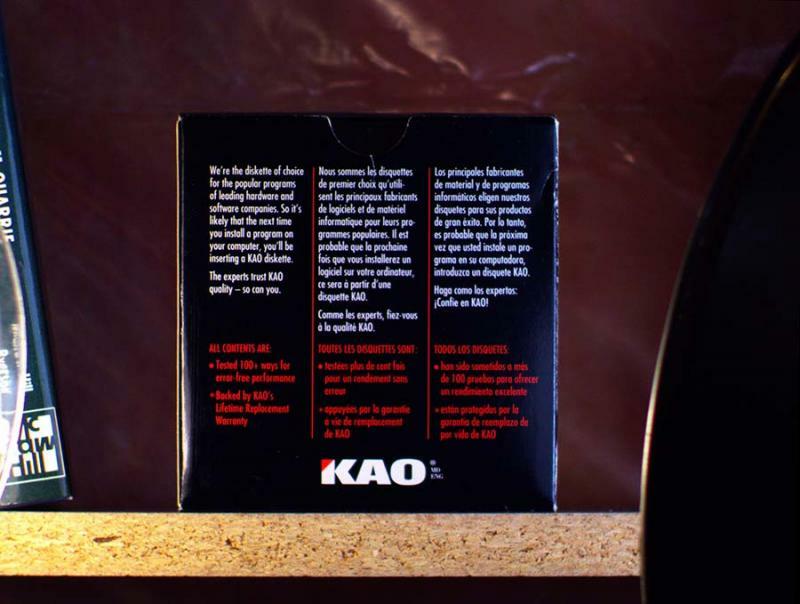 A lens diameter of 66mm is 2.6 inches... "a small telescope". RE: 3) Your term for "digital resolution" is not a good one. The term "resolution" has a very specific meaning when it comes to astronomical telescopes and your terminology treads on very thin ice. Call it something like "image sharpness" index (which you did in your charts) and it will less objectionable. Ans: It seems that I'm always in trouble with my terminology. Maybe that comes from being Canadian, I tread on thin ice 4 months of the year. RE: 4) As you know, the size of the Airy disk in the focal plane is simply a scaled value of the F/# so your variable of F/# per pixel size is nothing more than a number related to the number of pixels across the Airy disk... but it makes less sense (to me anyway) than talking about Airy disk sampling directly. Ans: True, but for me, it's a lot easier to remember: max pixel size (µm) = f/# / 3.5. The alternative is to calculate the diameter of the Airy disc and divide by 4.5. Max pixel size (µm) = (2.44 x wavelength(µm) x f/#) / 4.5 plus remember that teal-green light wavelength = 0.527µm. RE: 5) There is a rich body of literature about image evaluation using test targets... to eliminate your subjective evaluation of "image sharpness." Ans: I guess it's a question of how deeply a person wants get involved. My subjective 5-stage evaluation of 'very good' to 'very poor' can be easily seen and understood by me and by others. Overall, one might say that my experiment is 'absolute rubbish'... because to be valid, my tests should have be conducted at infinity, in absolute vacuum, free of any extraneous radiation and away from all gravitational influences. Oopps, then add in... tracking accuracy, quality of seeing, quality of glass, efficiency of sensor pixels, pixel microlens architecture, SNR of electronics of camera, sensor capture speed (framerates), image processing electronics of camera, video codec and compression of data, processing of image, final delivery medium/device for image to be seen, and skill of the imager. Yeah.... like maybe next time... when the Tooth Fairy and Santa Claus get married. Edited by RickV, 26 January 2017 - 06:36 PM. 1) It's easy to dismiss some of the limitations but understand that it's pretty shaky to assume that all of your various combinations will image as well at 9m as at infinity. 2) You obviously got pretty far along with your subjective 5 point rating scale and I'm not saying that that approach is invalid. My comments were aimed at suggesting how you (or anyone else) might turn this kind of exercise into more of a real measurement. 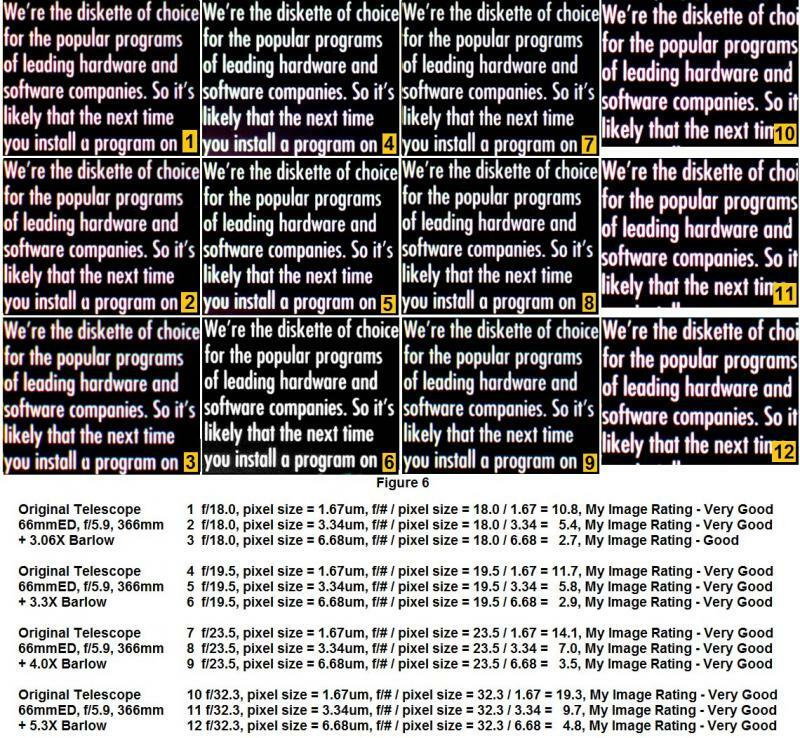 I took images of stars and DSOs using different binning and focal reducer options and compared them. But I like the OP's tests as well, free of all the other factors.